Paul Holleran has seen his side slide towards the relegation zone. 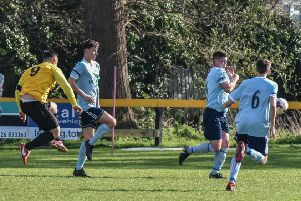 Leamington boss Paul Holleran has demanded his side respond positively to the upturn in fortunes of their relegation rivals, writes Paul Okey. Brakes go into tomorrow night’s crunch home clash with Chorley just a place and two points above the relegation zone in the National League North. Successive wins for Gainsborough Trinity and recent victories for AFC Telford and Alfreton have left his side anxiously looking over their shoulders in 19th. A final-day fixture between Gainsborough and fellow bottom-three side Tamworth further complicates Brakes’ survival fight and Holleran knows tomorrow evening offers the best chance of easing their drop fears. “We’ve slipped up a little bit,” he admitted. “There have been a few games that we could have had something but didn’t, could have got a point but we didn’t and other teams have responded. “Gainsborough have gained a couple of results, Alfreton have gone to Brackley and won and AFC Telford have got a result, too. Holleran conceded that the fixture pile-up has proved a hindrance to his side, with Saturday’s dour goalless draw with Curzon Ashton following on from an energy-sapping 90 minutes at AFC Telford less than 48 hours earlier. However, given the effort they put in at New Bucks Head, he said he had to see Saturday as a point gained. “It is no coincidence that Brackley hadn’t lost a home game in a year and after playing on a Thursday they lose. Telford, too, lost after a Thursday. “Telford took so much out of the players and Saturday was the worst spectacle of the year. “We started brightly but faded. “Part of me after the game was glad to get a point. Chorley come into tomorrow night’s clash in sixth place having won three of their last four. A 1-1 draw at Stockport on Tuesday night halted the winning sequence and Holleran is hoping his side can take advantage of their visitors’ exertions having had five days to recover themselves from the Curzon stalemate. “After a bit of a breather I know our energy levels will be better,” he said. “We’re playing one of the form sides but it is a big ask for them playing Saturday, Tuesday, Thursday. “We’ve got to get a result tomorrow because Saturday (at York) will be tough having played Thursday. “The whole scenario is unfair on players. “But when it’s all said and done it’s still in our hands.